This should rightfully be called 'yesterday's acquisitions' but I was too tired to post them after the event. Especially as my friends and I spent the evening watching a bunch of fantastic movies, namely Tiger & Bunny: The Rising, Puella Magi Madoka Magica: Rebellion and Kotonoha No Niwa (Garden Of Words) before my weekly Sengoku Basara: Judge End session. It was a great day. First up, CDs, DVDs and Blu-ray discs. I collected the US versions of Cat's Eye Season one, Hetalia: The Beautiful World, Aquarion Evol Part 2, Anohana: The Movie, The Devil Is A Part Timer! (Hataraku Maou-sama) and Amnesia. The Amnesia set came with two copies of the first disc since the original pressing had a rather embarrassing production error. I feel a little bad buying the standard Blu-ray version of the Anohana movie instead of the gorgeous special edition, but as it's mostly a recap and I don't know whether the music is any good it seemed prudent to save money. 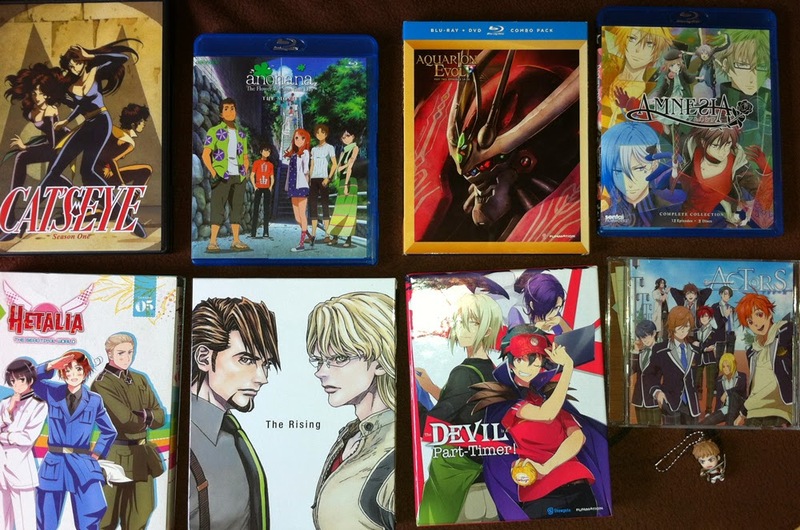 There's one Japanese import Blu-ray set in this picture and it's Tiger & Bunny: The Rising, which is the second film in the series. The first press edition of the movie comes with two bonus discs all housed in a gorgeous chipboard box to match the first one. The final item in this picture is Exit Tunes presents ACTORS, a CD collecting famous Vocaloid songs covered by male seiyuu such as Hoshi Souichirou, Okiayu Ryoutarou and Eguchi Takuya. How could I resist? 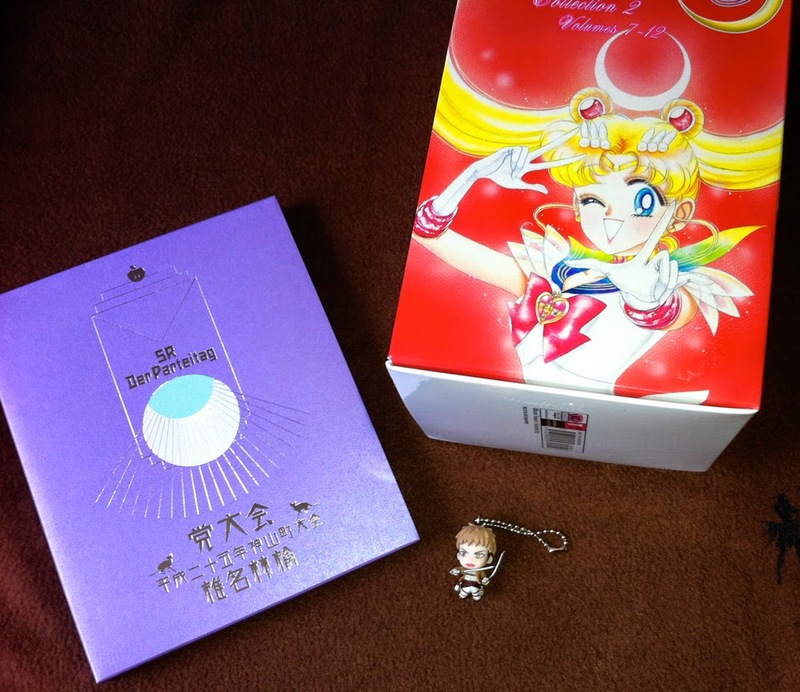 I picked up the second half of the Pretty Guardian Sailor Moon manga (the new release of Bishoujo Senshi Sailor Moon) from Kodansha's stand at Hyper Japan, and Shiina Ringo's Toutaikai: Heisei 25-Nen Kamiyamachou Taikai Blu-ray/CD set arrived by post. At the bottom of this picture is a slightly better look at the free Jean Kirstein (Shingeki No Kyojin) charm I received with my last Yesasia order. The last picture has a story behind it. My friend recently went to Japan on holiday so I asked him to enter Animate's in-store Diabolik Lovers Ani-Kuji lottery if he had enough time - I wanted to obtain the two exclusive drama CDs. Well, yesterday he produced all of the prizes he won for me. 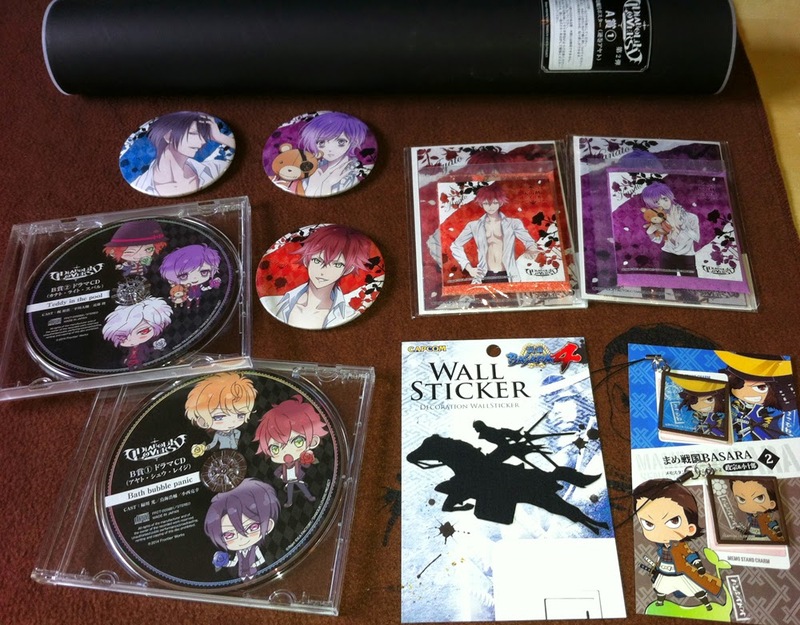 Not only did he get both CDs (amusingly titled Teddy in the pool and Bath bubble panic), he also won three large tin badges (Ayato, Kanato and Reiji), an Ayato bath poster and two sets of scented bath salts (Ayato, Kanato). Wow! There are a couple of duplicate items which I might give away someday. The Jean Kirstein charm is absolutely adorable! What an awesome freebie. A few of the titles you got are still on my "To Watch" list (namely Tiger & Bunny, Aquarion Evol, and The Devil is a Part-Timer!). Anohana looks really good -- and with Kayano Ai, Sakurai Takahiro, Irino Miyu, and Tomatsu Haruka all in the voice cast, I'll definitely be adding it to my list! What lottery luck! Haha. The chibis of the boys on the CDs kill me. I have a large Kanato bias but they all look so precious. I'm going to a convention next week and I'm hoping that there'll be some Diabolik Lovers items available.. I wasn't feeling too positive about it because of the anime's limited fanbase (it's a purely-anime convention) but since there was the recent announcement of a dubbing, maybe a table will be there after all. I'll wind up throwing all of my money at them if (for some reason) they had the Mukamis and Tsukinamis, as well. I finished watching The Devil is a Part-Timer! the other day and it was absolutely superb; I really enjoyed it. Highly recommended! There's very little Diabolik Lovers content at conventions near where I live (though more than there is Sengoku Basara merchandise for some reason) so it's tough. I hope you manage to find some. It definitely has a fan base out there even if the anime seemed to attract a lot of complaints from people who didn't give it a proper chance. When I visited France for Japan Expo I found a few stalls selling the smaller trading figures so there's hope! Hmm... I don't have any duplicated Kanato items, but if you want my extra CD (Shuu/Reiji/Ayato) and Reiji badge free of charge you can email me your postal details (there's a little form in the column on the right). I know it's a weird thing to offer as a stranger, but they're just sitting next to my desk gathering dust right now. Ah, good to know! I have limited knowledge in comedic anime (I'm a little picky when it comes to the genre) but I've heard good reviews all around on the series. I'll definitely have it on priority! Ah.. really? I would love them if you're willing to part with them! I'm sure postage wouldn't be the cheapest as I live in the US, but I can cover the shipping if you're sure (and a little extra if you'd rather not give them away for free!). Sengoku Basara is probably as different from Diabolik Lovers as it is possible to be, but I hope you enjoy it. FUNimation should have it up on Netflix/Hulu/YouTube and their site so it should be relatively accessible!